Japan is the second largest diamond and jewelry consumption market in the world. Uchihara Group has established an unparalleled retail network in this country, which notably includes the top class department stores such as Takashimaya, Isetan Mitsukoshi, Hankyu, Sogo&Seibu, etc. 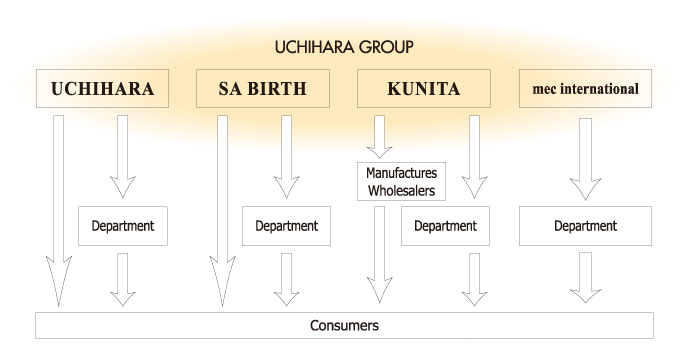 Uchihara Group also relies on a strong wholesale business network, servicing retailers, wholesalers and manufactures. Uchihara intends to broadly promote high-end quality with its key brands, SA BIRTH , ROYAL ASSCHER , SCHROEDER , and CRIVELLI. In seeing the PDF document, Acrobat Reader Japanese version is needed. Copyright © UCHIHARA Co., Ltd. All rights reserved.